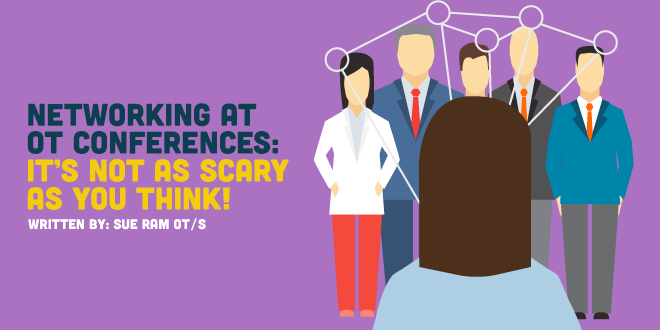 Networking at OT Conferences: It's Not as Scary as You Think! Whether you are a conference newbie or an experienced conference-goer, these tips can help you increase your abilities for networking at OT conferences! We are always told that as new grad occupational therapists we should go out there and "network". Here are some tips to get you through networking at OT conferences (national and state) or any other event that you plan on schmoozing at! Literally. Carry extra gum or mints in your pockets or bag. Having a fresh, minty breath can help you feel cool and confident when approaching someone. Mints and gum can also be a nice “ice-breaker”. Plus, you’ll look super prepared if anyone asks you for some. Better yet, play a game! I recently attended a child and adolescent behavioral health conference where my organization and I played a networking game. We all received a paper that had a list of questions to ask other conference-goers. Questions each had different point values and whoever had the most points at the end of the conference won a small prize. You get the point. Get super creative with the questions. It may seem silly, but when I played a game like this, I had a really fun time going up to people and just starting conversation. Just make sure to get confirmation of everything you answer whether it is taking photos or getting someone’s email or number! This may be self-explanatory, but be yourself and your confidence will shine through on its own. You know your strengths and this is a great time to show it to others. Don’t be afraid to approach a speaker after a short course or a poster session. No need to be shy! The point of networking at OT conferences is to talk to people. Everyone in the room is there for the same reason as you. And it's to talk! They want to spread their knowledge and you should want to do the same. We can all learn from each other and you have to believe in yourself that you have something to offer to every person you encounter. This has honestly helped me out so much when it comes to networking. I found in difficult in the past to rely on typing memos or emails into my phone or writing it on a napkin only to realize I already threw it in the trash. Business cards are useful because it helps others have something to take away from your meeting to remember you. Also, it helps in keeping contact with someone in the case they don’t have a business card to give you. Then you just have to hope they contact you eventually! Try to create a sleek and easy-to-read design that is unique to you. I got my business cards from Vistaprint and they have been a hit so far. This is useful in the event neither of you has business cards. You can just use your phone to add them when you get back to your hotel or when you get home. This is a great way to remember someone by having a picture to remind you of who they are. Sometimes, you can even use LinkedIn to connect with others before your event. It is also nice to have your LinkedIn come up on a simple Google search in the case you connect with a future employer! When you approach someone and you are holding a bunch of papers/brochures, it may be difficult or even awkward to have to either put all your stuff down just to get a quick handshake in or business card swap. You don’t want to be on your phone the entire time, either. You become more approachable when you look unoccupied. If you are staring at your phone constantly, most likely nobody will approach you because they are just going to assume you are doing something really important! It may be hard to connect with others if you are strolling in late to a session or event. If you get there a little early, you have more chances of having conversations with others. A good thing about this is that you already most likely have something in common with everyone there- an interest in the topic. Use that to your advantage and use the session topic as a starting point! Don’t be a wallflower and show them you are worth getting to know and that you are genuinely interested in getting to know others. Again, don’t be on your phone the whole time unless it is necessary. Pay full attention to what the other person is saying and be genuinely interested. Don’t spend the entire time trying to sell yourself to the person. Instead, ask them about how they got into OT or what area of practice they’re in. Ask about any current projects they’re working on as well. When you are done talking, wish them the best and all the success and that you hope to connect with them again in the future. Something that I do to be mindful of my body language is to do a mental body scan. I start at my head and work my way down. I make sure to make eye-contact, have a welcoming smile on my face, shoulders relaxed, good posture, arms uncrossed but casual, firm handshake, and feet on the ground. You want to be approachable. Even though you have your arms crossed and aren’t necessarily irritated, people won’t really know that. They may just assume something is wrong. Some events have special networking opportunities and receptions that are made specifically for the event you’re attending. Be sure to scope these out before hand in case it reaches capacity or requires a reservation in advance to attend. Always follow-up with those who you receive contact information for. Email them a short thank-you and say one memorable thing from your conversation so they can remember you. If you have their address, send a thank-you note. Doing this lets the person know that you were thankful for the time you spent in getting to know them. Think You Know What Occupational Therapists Do? Think Again!